Cumberland County in Maine is the site for a pleasant little town called Freeport. According to the 2010 census, the town has a population of 7,879 residents. There are usually a lot more people in the vicinity because the town receives visitors from all over the county. There are a number of outlet stores located here as well as prominent shopping centers. There is easy access to the town from Interstate 295 and US 1. 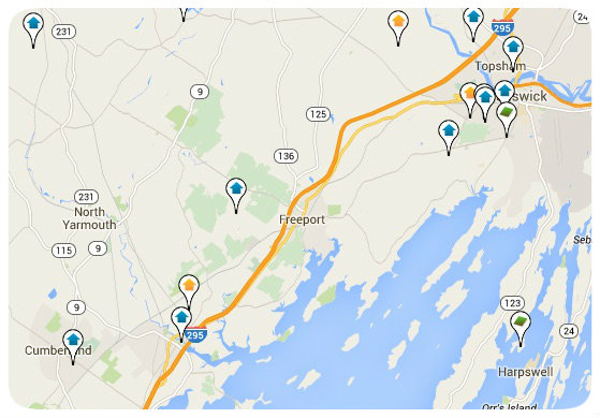 Residents from nearby areas find it convenient to Stop & Shop. Freeport was once a part of North Yarmouth; then called Harraseeket. The town was settled in 1700 and was incorporated in 1789. The area is now part of the National Register and Harraseeket is considered a Historic District. The town borders Brunswick and their home to the North and covers 46.7 square miles. Yarmouth is positioned to the Southwest and Pownal to the west. The town also shares borders with Cumberland and Harpswell through their connections with Casco Bay. Homeownership is important in Freeport. The majority of residents are homeowners (66.3 percent) while 33.7 percent of residents are renters. The average house was built in 1980 and averages 1590 square feet. The majority of residences are single-family homes (81.9 percent) with 6.6 percent of residential property going to condominiums. The folks in Freeport are friendly and neighborly. There are approximately 3,209 households (based on the last census) when joy the peaceful small town atmosphere. Anyone thinking of choosing small-town suburban life in Cumberland County should take a good look at Freeport as a viable option. Listing courtesy of Berkshire Hathaway HomeServices Northeast Real Estate.